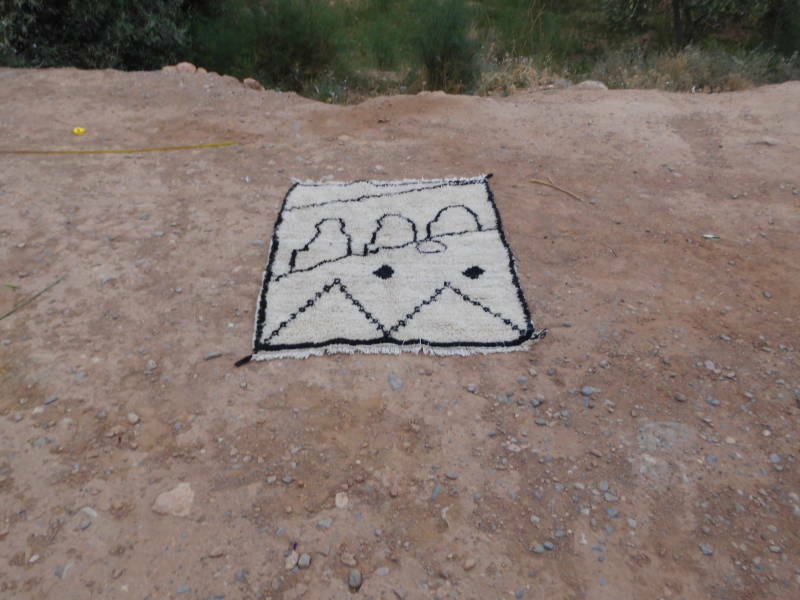 Pile knot rugs are plush and warm rugs commonly woven in Muoy and often contain traditional symbols unique to the surrounding region. 2481Dh: This price includes shipping within Morocco. To order, e-mail us at hello@theanou.com and we will help you with payment options. 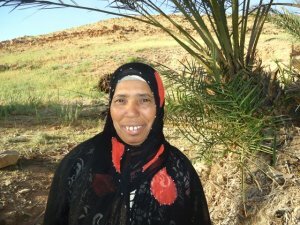 2481Dh: Le prix inclut la livraison au Maroc. Pour passer commande envoyez nous un message à l'adresse hello@theanou.com et nous vous présenterons les différentes options de paiement. Want to visit Association Tadighoust in person? 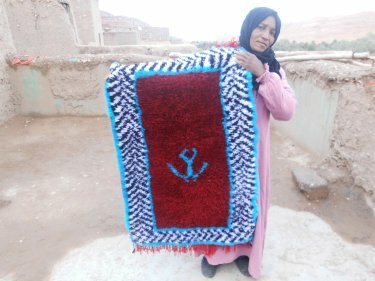 The cost is $10 USD per person, all of which is donated to the cooperative. Visits include tea, snacks and work demonstrations! Fill out the form below and we'll send you additional details and payment options when artisans confirm your time. 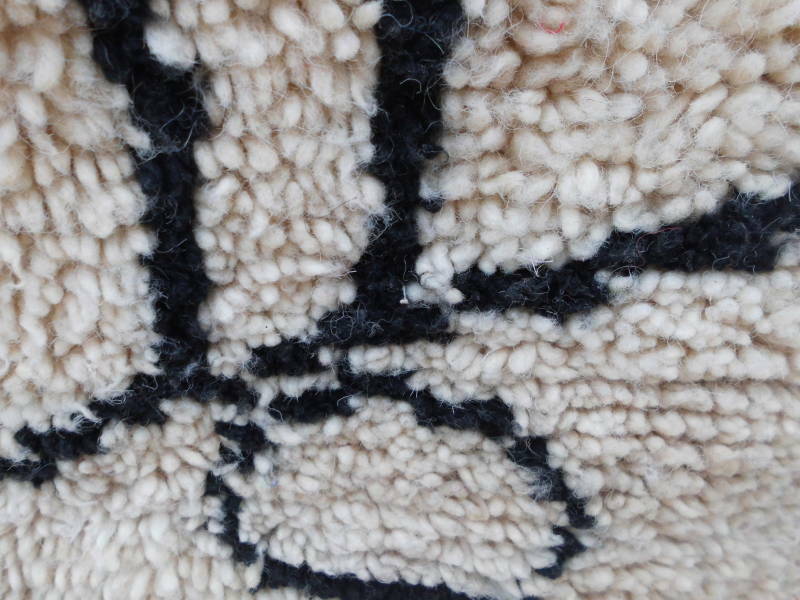 To make this item, the association uses assorted threads from various materials such as wool, ... show more To make this item, the association uses assorted threads from various materials such as wool, cotton or synthetic wool. 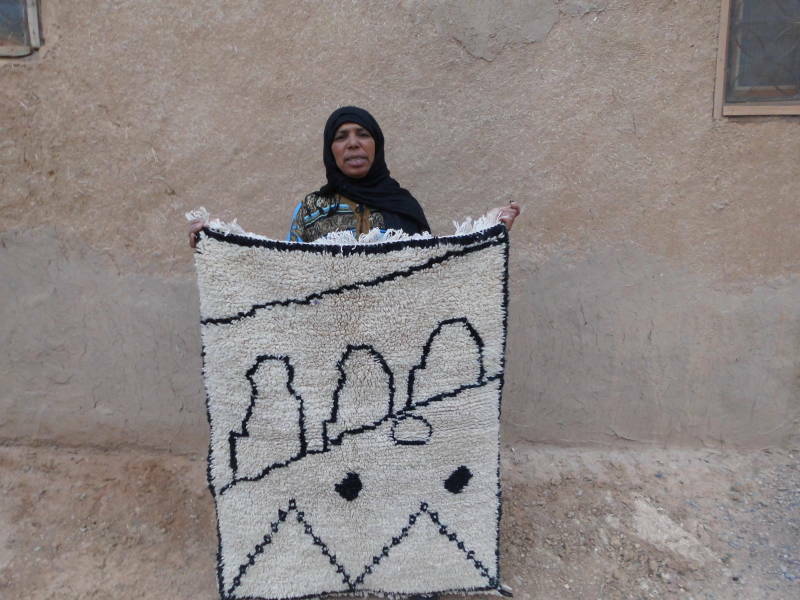 Cotton string is purchased in a nearby souk, or market, and is used to create ... show more Cotton string is purchased in a nearby souk, or market, and is used to create the warp of this item. 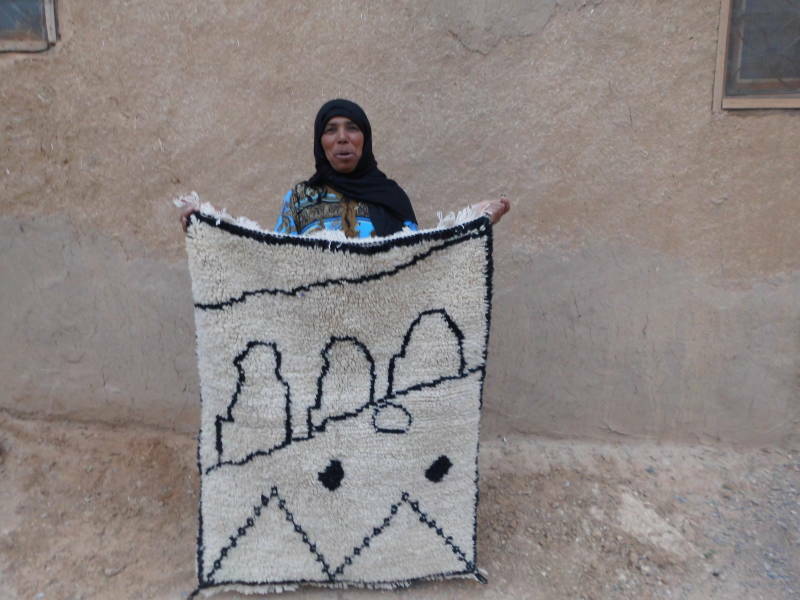 The mdura is a tool that is used to pound the weft together so it ... show more The mdura is a tool that is used to pound the weft together so it fastens to the warp of the rug. 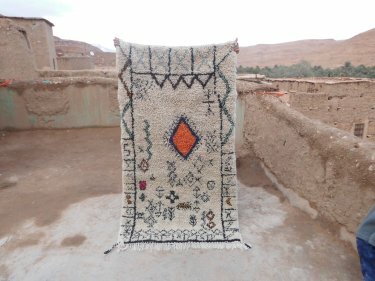 After fine sheets of wool has been created with studded boards, the weavers use the ... show more After fine sheets of wool has been created with studded boards, the weavers use the spindle to create thread which is then used for the weft of the rug. 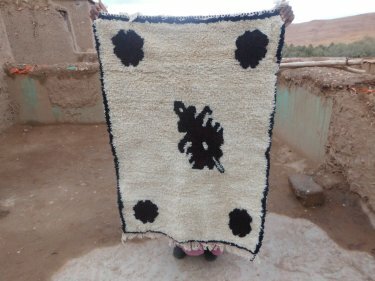 After the association purchases wool, they will comb the wool with these studded boards to ... show more After the association purchases wool, they will comb the wool with these studded boards to create fine sheets of wool that can then be spun into thread. 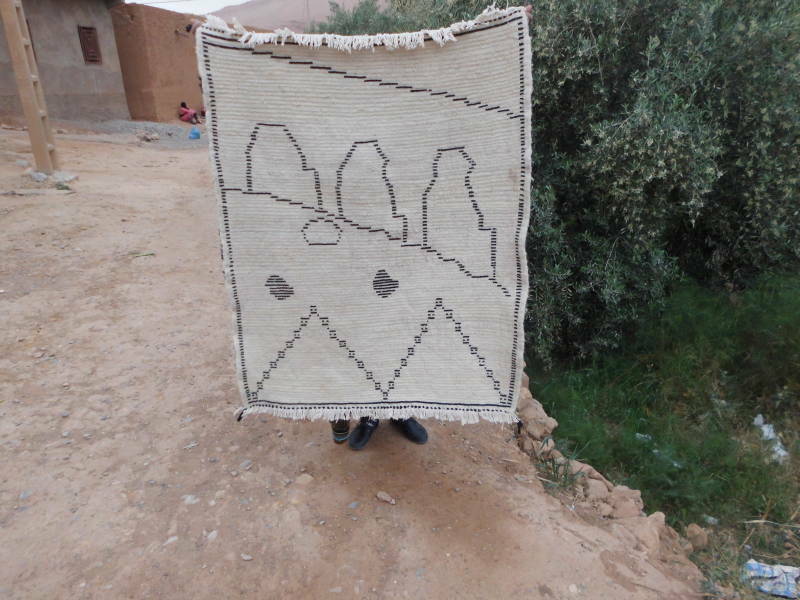 This rug is woven on a traditional wooden loom that is shared by the women ... show more This rug is woven on a traditional wooden loom that is shared by the women of the association and other members of the village. Using wooden looms can sometimes slightly warp a rug, giving it a unique finish.